Not only did Kerfe’s post inspire me, I downright copied her. I do love owls. Here is a cute one that is now extinct. The most famous extinct bird of all: the Dodo. Pinto’s Spinetail is an endangered bird that hives in subtropical forest and shrubland in NE Brazil. Just 2% of native forest remains in this area, and less than 1000 of these birds are currently surviving. They mate for life, and my favorite fact about them is that “pairs sing in duets to defend their nesting territories”, according to abcbirds.org. And the Oracle was insightful, as always. On my way to the beach (although the forecast is for a rainy week). Nina has promised to keep you entertained while I’m away. I meant to write a quadrille (44 words) with the secret keeper’s words this week, but I wasn’t paying attention really, and the “6-5-6-5-6-5-6-5” I wrote down beside each line became syllables instead of words. I also meant it to be more about the birds. I used all the words though! Now to the subject at hand: The parrot is painted with the new gouache I got for Christmas. I wanted to do something bright and colorful to start, and a parrot seemed the perfect subject. Parrots are symbolically associated with voices, words, communication, and the power of truth. They do not keep secrets. They are also linked to color magic. And, like many birds, they serve as messengers between heaven and earth. They are also endangered, due to habitat loss and the pet trade. These intelligent sub-tropical birds can live 80-100 years; a pet parrot is a lifetime investment, requiring enormous amounts of attention, care, and intellectual stimulation to thrive. Needless to say, both birds and humans are better served by leaving these social animals in their natural habitats, and protecting those habitats. 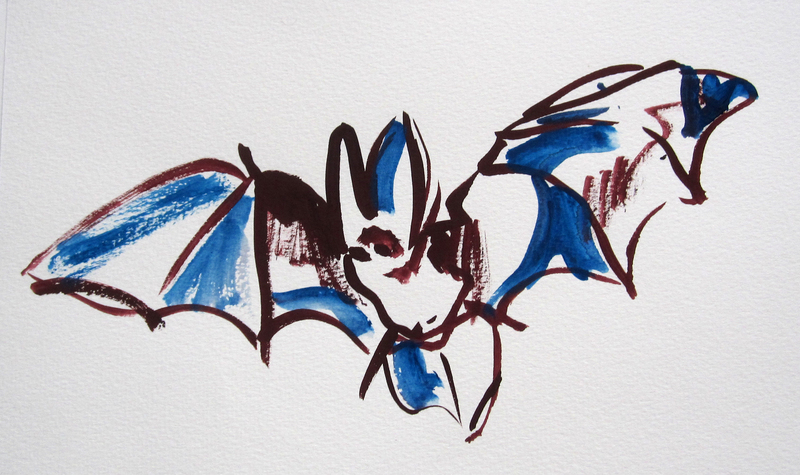 It’s Bat Appreciation Day…a reminder of how vital they are to ecosystems everywhere. Insect control, pollination, and seed dispersal are all important ways that bats help keep the earth in balance. Many bat populations are endangered for the usual reasons: habitat loss and fragmentation, hunting, disease, use of chemicals. Bats play an important part in story and myth as well. Because they often live in caves and come out at dusk, bats are associated with the ambiguity of night. Western culture tends to give bats an evil shading (think vampires and the wings of devils), but many Asian and Native American cultures associate them with good luck. Today also marks the celebration of Haiku Poetry Day. How do I know this? Charlie at Doodlewash is sponsoring a month of celebratory days, and he made sure I knew about Haiku Poetry Day for NaPoWriMo. You can see previous bat posts here and here. And learn more about bats and bat conservation efforts here. Last February I posted about the wonderful bird paintings showing up in my neighborhood. At the time, the man behind the project, Avi Gitler, told me to watch for more birds. Wow! He wasn’t thinking small. 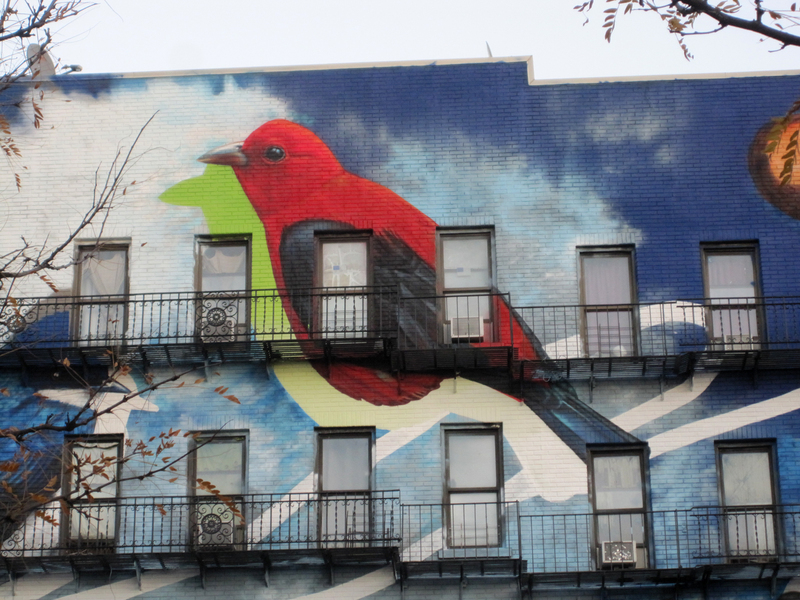 Imagine my surprise when I walked over to Amsterdam Avenue a few months ago and saw…an entire building filled with birds (and James Audubon too!). This beautiful mural, “Endangered Harlem” was painted by a young artist from Baltimore, Gaia. 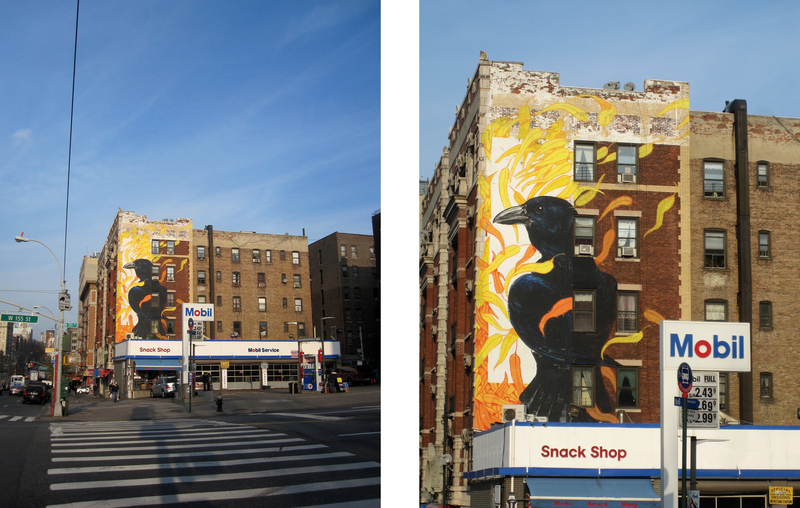 At the corner of 155th Street and Broadway are two murals, flanking the gas station there. “Fish Crow”, by Italian artist Hitnes, is also part of a project he did where he created 15 bird murals following Audubon’s journey across the United States. You can read about this project and see more of the murals here. 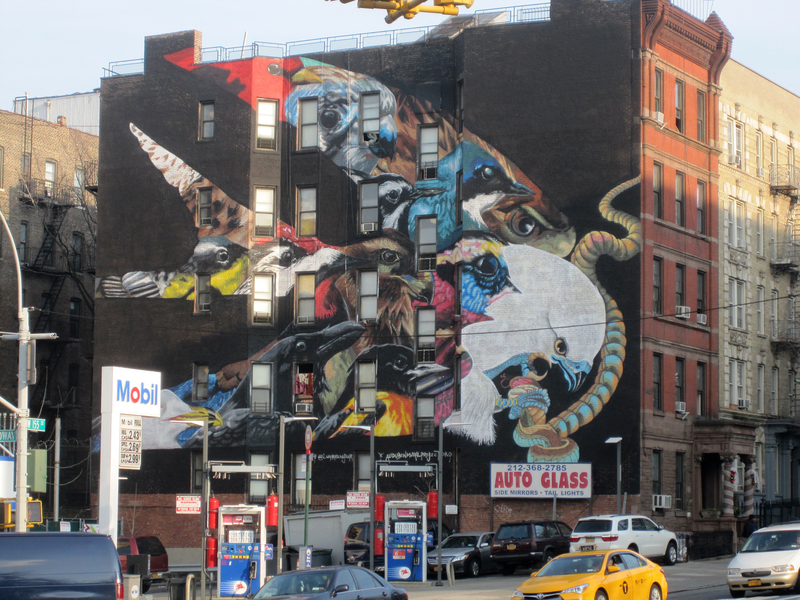 The other mural on this corner, “Swallow Tailed Kite (and others)” was painted by the Ecuadorian-American artist Lunar New Year. You can see more of his wonderful work on his website here. …and Happy National Bird Day! Let’s all work to help save these beautiful creatures from extinction. And don’t forget Draw-a-Bird Day, the 8th of each month, is coming up again on Friday! I haven’t had the watercolors out for awhile, and this little guy caught my eye. Lemurs are found only on Madagascar. 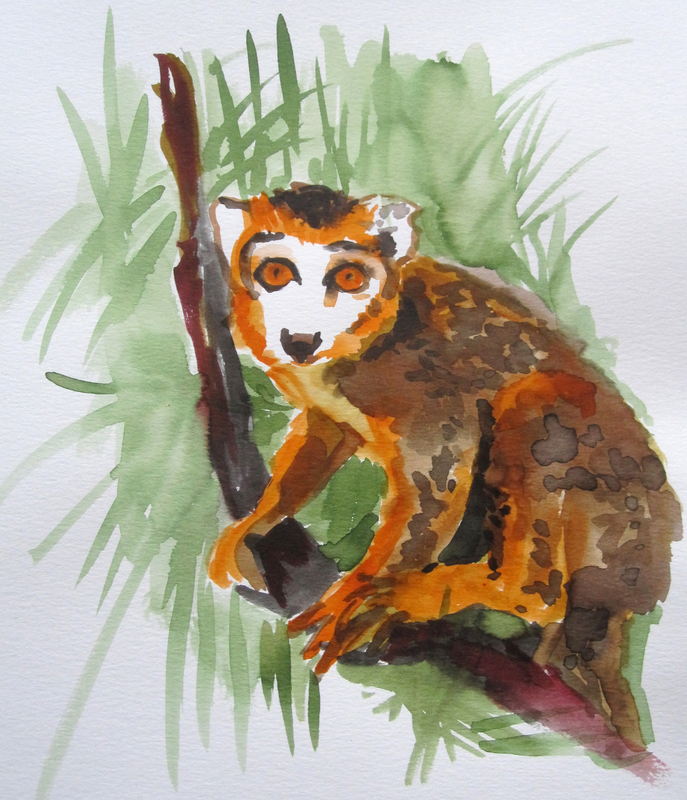 All lemur species are endangered due to shrinking and fragmented habitat. They are also poached, even from reserves, for food, and kept as pets. Seventeen species of lemur are already extinct. The ring-tailed lemur was featured in a previous endangered species post. …but their numbers are down 90% since 1992. You can help by planting milkweed, which is their main food source. Read more here. This was another painted sketch done with my leftover brown paint. I also did a monarch post with a collage; you can see it here. 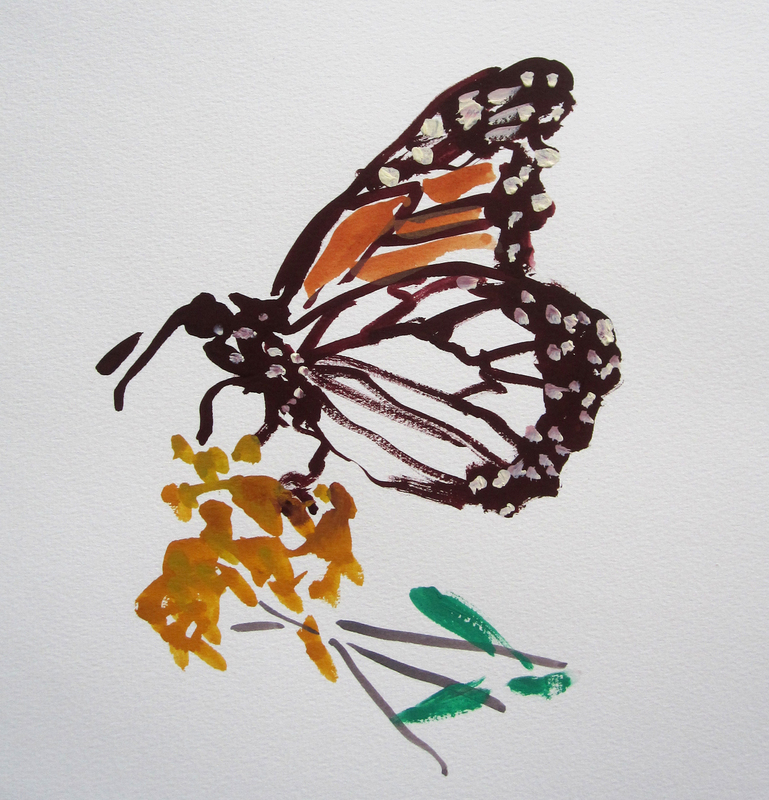 I’ve been neglecting the endangered species category for awhile, but when I squeezed out way too much brown paint the other day, I did a number of simple painted line drawings with the excess. For one of them, I used a reference for snub-nosed monkeys that I had in my file of animals. I don’t know if it’s just this photo, but the blue face is very exaggerated compared to others I’ve seen. The strong blue works well with the brown lines though. Snub-nosed monkeys are found in southern China and northern Vietnam and Myanmar. They live in large groups in the same mountain forests that giant pandas prefer. This habitat is disappearing, due to human settlement, but especially due to forest destruction as a result of logging. 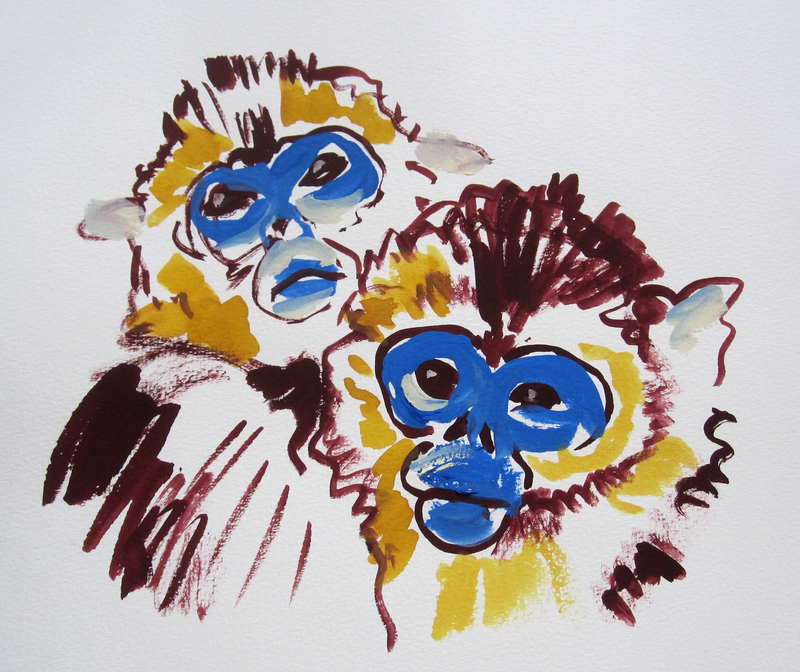 The monkeys are also hunted for their fur and body parts, which are used in Chinese medicine. It seems no creature is immune from the voracious appetite of Chinese medicine. For their part, China has established reserves for both monkeys and pandas in an attempt to save both. However, the species of snub-nosed monkeys that live in Vietnam and Myanmar have no such protection and are critically endangered. You can read more about snub-nosed monkeys here, and see the rest of the endangered species posts here.